Pub 10 is the very fine Craft Beer Co. in Farringdon. This is not a beautiful pub, not a historic pub, but it is a very fine pub. Just look at the row of beer available on tap. And there’s even more variety in the refrigerators lining the walls. This is truly a place for lovers of beer. Their home page says that they were rated the 4th best bar in the world, and for the sheer selection of ales, I must say that it’s a place worth visiting again and again. This was my 4th visit to Craft Beer Co. and I’ve taken to only trying their beers in 1/2 pint glasses, to allow me to try more. This bar doesn’t have a full menu, unfortunately. The place is usually packed inside and patrons spill out on to the street, which is actually quite enjoyable in the late evenings, in mild weather. I’ve taken a few friends to this bar, and it will continue to be a stop on my London tour, especially if one is a fan of great craft beer. 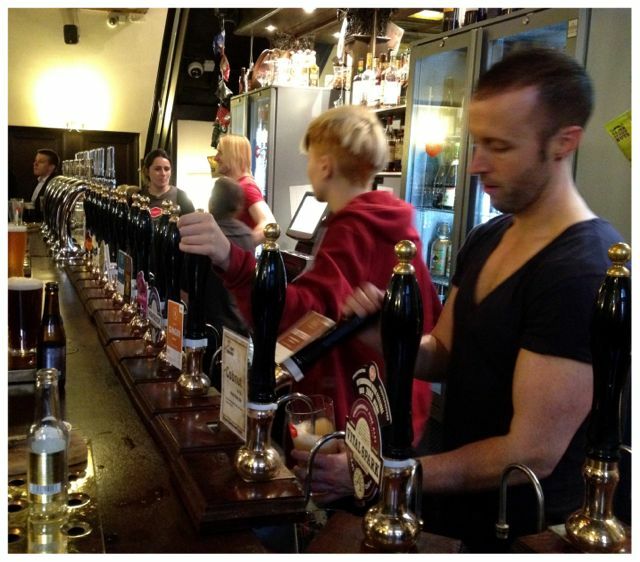 This entry was posted in Beer and tagged 100 Pubs, Beer, craft beer, Farringdon, London by Krishna. Bookmark the permalink.